The man behind the most successful manga series to have been published by Weekly Shonen Jump, One Piece. Casual fans enjoy his work, dedicated fans love and adore him, and die-hard fans call him god. How much do you know about him? How much more would you want to know about him? Lets start by a quick look at the Legend’s Bio Data. His top three favorite movies are: Seven Samurai, Young Guns and Nightmare Before Christmas,The Million Ryo Pot. Oda wrote the story for the tenth One Piece movie, Strong World, for the anime’s 10th anniversary. This was the first time he wrote a script for any of the movies. Second half of 1992: second place Tezuka Award for Wanted! 2015: Guinness World Record for “the most copies published for the same comic book series by a single author” with 320,866,000 copies printed worldwide as of December 2014. Now that you have taken a quick look about Oda and his achievements, let’s dig deeper and know everything about him from the very Childhood. Eiichiro Oda claimed that at age four he resolved to become a manga artist in order to avoid having to get a “real job”. His biggest influence is Akira Toriyama and his series Dragon Ball. He recalls that his interest in pirates was probably sparked by the popular TV animation series titled Vicky the Viking. He submitted a character named Pandaman for Yudetamago‘s classic wrestling manga Kinnikuman. Pandaman was not only used in a chapter of the manga but would later return as a recurring cameo character in Oda’s own works. In 1992, Oda at age 17 began his manga career starting as an assistant to three different mangakas for the weekly shonen manga magazine Shonen Jump. In the same year he submitted his first work called Wanted! for which he won second place at Tezuka Award. At first he worked with Masaya Tokuhiro on Jungle King Ta-Chan in 1992. In 1994, he briefly worked with Shinobu Kaitani with Suizan Police Gang before going back to Tokuhiro. In the same year he left college as a freshman. After Jungle King finished its run in 1995, he and Tokuhiro went on to create Mizu No Tomodachi Kappaman, it ran from 1995 to 1996. Also in the same year he moved on to work with Nobuhiro Watsuki on Rurouni Kenshin in 1996. During this time Oda met Hiroyuki Takei. Oda drew scenes in that manga with his own art style. During 1993 and 1994, he created other works such as God’s Gift for the Future (1993), Ikki Yako (1994) and Monsters (1994), the last of which he would later mix with One Piece. In late 1996, while still working with Watsuki, he created two one-shots for the upcoming manga artist showcase called Romance Dawn, Version 1 and Version 2, which would become the first chapter of One Piece. In 1997, he later quit working with Nobuhiro to begin working on One Piece, doing many early One Piece sketches that would appear in Color Walk 1. He planned out the early stage of One Piece (chapters 1-8) before he officially started it. However, he made many changes, such as changing Boogie to Buggy, changing Zoro from being Buggy’s henchman to being a wandering swordsman, and changing Morgan’s appearance (he was originally supposed to look like a Sumo but Oda’s editors wanted him to change it, which he did). Later Nobuhiro Watsuki would pay a tribute to Oda by drawing the Straw Hat Pirates’ jolly roger in one chapter of Rurouni Kenshin as a picture on a bomb used by Gein, one of Yukishiro Enishi’s subordinates. Finally in July, 1997, he drew the first chapter of his signature work, One Piece. Having been inspired by pirates, he made One Piece a pirate series. In 1998, Oda did designs for the first OVA and was happy to see One Piece getting animated. In 1999, Toei Animation adopted One Piece and the staff would often meet up with Oda to discuss how to handle the series. In 2002, he met Chiaki Inaba, who played Nami during the Shonen Jump Festa, and the two started going out, and in 2004, they got married. In 2006, he and his wife had a daughter. In April 2006, Oda unexpectedly fell ill and One Piece was not released that week. However he recovered and resumed One Piece the next week. Because of his recent illness, Oda felt the fans needed to catch up so he created Grand Line Times. After working as assistants to Watsuki, Oda, Hiroyuki Takei and Mikio Itō remain good friends. He also stated several times that he is friends with Mitsutoshi Shimabukuro, the author of Toriko. Oda referred to Masashi Kishimoto as both a friend and a rival. For the title page illustration of One Piece chapter 766, which ran in 2014’s 50th issue of Weekly Shōnen Jump alongside the final two chapters of Kishimoto’s Naruto, Oda included a hidden message and other tributes in the art. Kishimoto himself also made a tribute in the ending of Naruto where the character Boruto Uzumaki makes a drawing of the Straw Hat Jolly Roger on a mountain. In 2009, a woman was arrested for sending roughly one hundred threatening emails to Oda between September to December 2007. The woman’s husband was an assistant at Oda’s office who had been dismissed.e short-story manga. In 2007, at the JUMP Fiesta 2008, he wore a hot pink wig for the part and explained he would only do this because One Piece was in its tenth year. 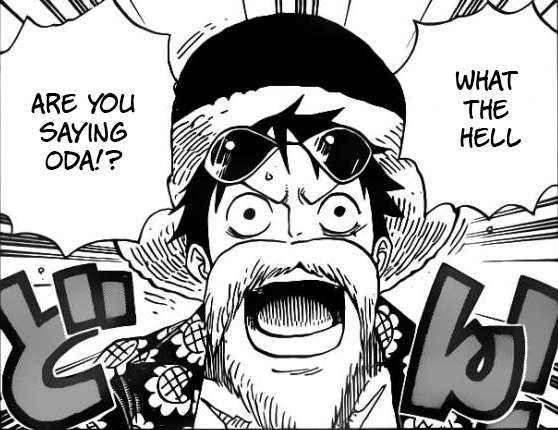 With the series now going on for more than 20 years, it’s given that Oda is dedicated to the series as well as the fans who support him. He works 21 hours a day, 6 days a week, to be exact he sleeps from 2 a.m.-5 a.m. That is how much he is dedicated himself to One Piece,But it doesn’t just end with there, When Eiichiro Oda was hospitalized in 2013, Masashi Kishimoto (Naruto’s mangaka) visited him at the hospital and witnessed Oda drawing next chapters of One Piece while being bedridden! That’s right, even being bedridden doesn’t stop him from working on One Piece, the only way to keep him away is to knock him out with really strong sleeping gas! If that isn’t dedication, then I frankly don’t know what is. And it isn’t because Eiichiro Oda needs to work, he earns approximately 3 Billion Yen (about 30 million U.S Dollars) from the royalties related to One Piece each year! He doesn’t need to work, it’s just his dedication that keeps driving him forward even at a place he ought to rest! This is coming from the best mangaka of our time, it truly made fans shed a tear for his dedication and hard work, he also received millions of get well soon wishes from fans around the world. One more thing In 2009,He almost cried after being “thanked” by fans for his hard work. “Ever since last year, when I’d get tired, the body part in my throat called “tonsils” would start to swell up. It really interfered with my work so this operation’s in order to remove those tonsils. But since I’m going to go under the knife, I think I might as well ask them to add bazookas to my shoulders. I’ll be back with a stronger body that’ll be able to take on all the different jobs I’ll be doing in the second part of this year. Voice of Odacchi in Dream Soccer King!. Played Shanks in the 2008 Jump Festa. Name appeared on the mirror in Episode 21 (minute 3:09), on a book in Episode 70 (minute 18:21) as an Easter Egg and among Ohara’s books in Episode 278 (minute 12:49). Oda’s avatar (with the fish head on his head) is a support character in Gigant Battle and Gigant Battle 2: he draws a manga panel which traps opponents. Oda stated in an interview that he wanted to create a robot manga after he finished One Piece. Later, however, he stated that after he finishes One Piece, he would take the same path Toriyama did and create short-story manga. Weekly Shonen Jump & Viz Media: Official information source for apology message apforums.net: Various News.